Abstract. Low-cost sensing strategies hold the promise of denser air quality monitoring networks, which could significantly improve our understanding of personal air pollution exposure. Additionally, low-cost air quality sensors could be deployed to areas where limited monitoring exists. However, low-cost sensors are frequently sensitive to environmental conditions and pollutant cross-sensitivities, which have historically been poorly addressed by laboratory calibrations, limiting their utility for monitoring. In this study, we investigated different calibration models for the Real-time Affordable Multi-Pollutant (RAMP) sensor package, which measures CO, NO2, O3, and CO2. We explored three methods: (1) laboratory univariate linear regression, (2) empirical multiple linear regression, and (3) machine-learning-based calibration models using random forests (RF). Calibration models were developed for 16–19 RAMP monitors (varied by pollutant) using training and testing windows spanning August 2016 through February 2017 in Pittsburgh, PA, US. The random forest models matched (CO) or significantly outperformed (NO2, CO2, O3) the other calibration models, and their accuracy and precision were robust over time for testing windows of up to 16 weeks. Following calibration, average mean absolute error on the testing data set from the random forest models was 38ppb for CO (14% relative error), 10ppm for CO2 (2% relative error), 3.5ppb for NO2 (29% relative error), and 3.4ppb for O3 (15% relative error), and Pearson r versus the reference monitors exceeded 0.8 for most units. 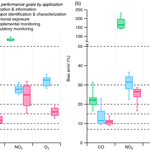 Model performance is explored in detail, including a quantification of model variable importance, accuracy across different concentration ranges, and performance in a range of monitoring contexts including the National Ambient Air Quality Standards (NAAQS) and the US EPA Air Sensors Guidebook recommendations of minimum data quality for personal exposure measurement. A key strength of the RF approach is that it accounts for pollutant cross-sensitivities. This highlights the importance of developing multipollutant sensor packages (as opposed to single-pollutant monitors); we determined this is especially critical for NO2 and CO2. The evaluation reveals that only the RF-calibrated sensors meet the US EPA Air Sensors Guidebook recommendations of minimum data quality for personal exposure measurement. We also demonstrate that the RF-model-calibrated sensors could detect differences in NO2 concentrations between a near-road site and a suburban site less than 1.5km away. From this study, we conclude that combining RF models with carefully controlled state-of-the-art multipollutant sensor packages as in the RAMP monitors appears to be a very promising approach to address the poor performance that has plagued low-cost air quality sensors. How to cite: Zimmerman, N., Presto, A. 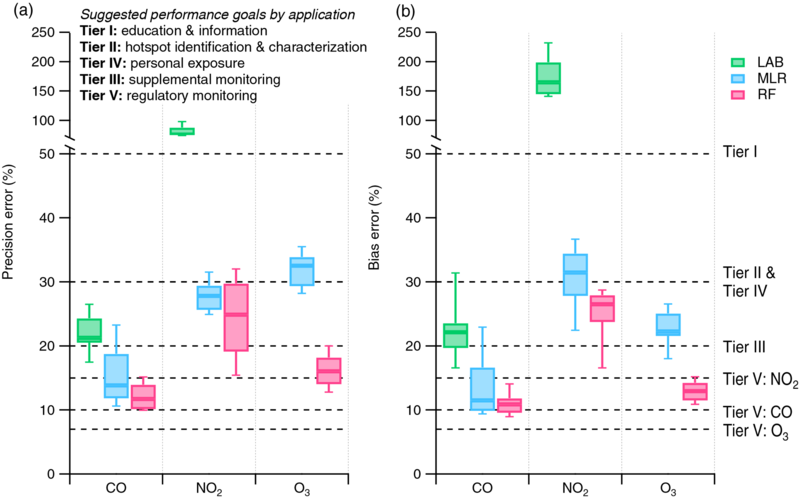 A., Kumar, S. P. N., Gu, J., Hauryliuk, A., Robinson, E. S., Robinson, A. L., and R. Subramanian: A machine learning calibration model using random forests to improve sensor performance for lower-cost air quality monitoring, Atmos. Meas. Tech., 11, 291-313, https://doi.org/10.5194/amt-11-291-2018, 2018.